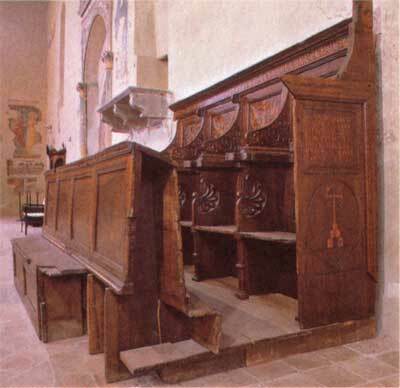 An inscription on the right side points out that the counter was made by Stefano Cambi, the father custodian of the convent. According to the uses of the time, it was intended to house the magistrates who attended religious practices. The inlay motifs are inspired by the “grotesques”: the bizarre ornamental compositions of classical inspiration which were in use from the late 15th century, when the decorations of the Nero’s Domus Aurea were discovered. They were called “grotesque” because, when they were discovered, the rooms of the Domus were covered by ground and so had the appearance of caves.